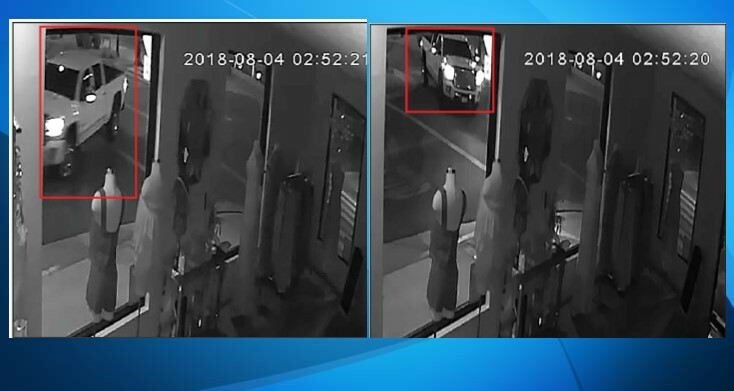 LANCASTER – Sheriff’s detectives have released images of the pickup truck that struck a man in Lancaster during the early morning hours of Aug. 4, and they’re seeking the public’s help in finding the hit-and-run driver. The collision occurred around 2 a.m. Saturday, Aug. 4, on Lancaster Boulevard near Elm Street, according to a news release from the Sheriff’s Information Bureau. “Detectives have learned the male adult victim was standing in the street on Lancaster Boulevard talking to the occupants of a black sedan, which was parked on the south curb line. A full-size white truck, late model Chevrolet or GMC, possibly 2500 or 3500, was driving east on Lancaster Boulevard at speeds in excess of the posted 15 mph speed limit. The truck struck the victim and stopped before speeding away from the scene towards Sierra Highway,” the news release states. 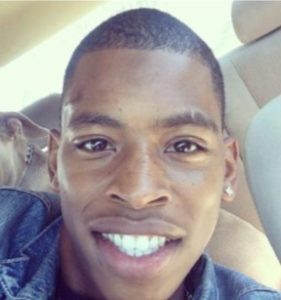 The victim, identified as 22-year-old Rodney Tyrone Richard, was transported to a hospital where he died of his injuries. 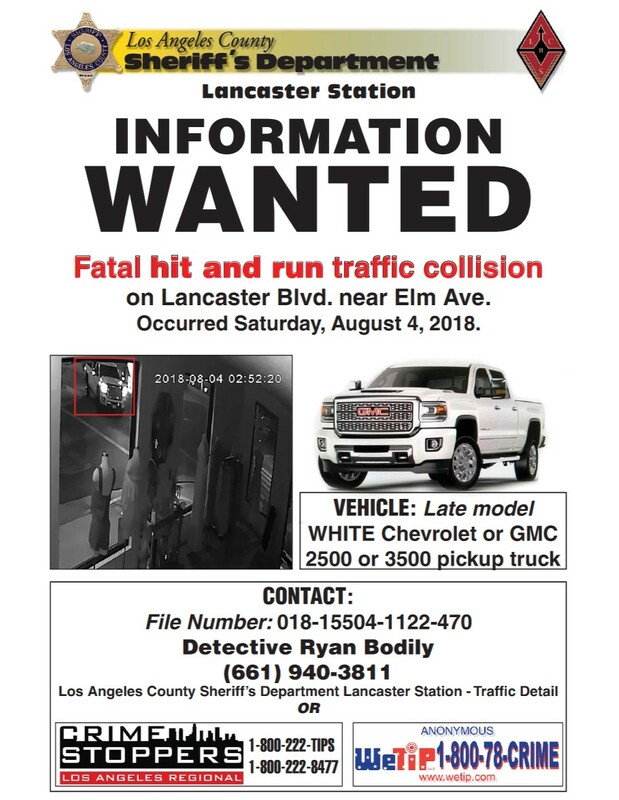 “Witnesses at the scene were not able to get a license plate for the truck… Lancaster Station Traffic Investigators need the public’s assistance to locate the white truck and identify the driver,” the sheriff’s news release states. Anyone with information regarding this collision is encouraged to contact Traffic Investigator Detective Ryan Bodily at Lancaster Sheriff ‘s Station at 661-940-3811. UPDATE: Authorities have released security video of the truck believed to be involved in the hit-and-run death. View the video here. 8 comments for "Public’s help sought in fatal hit and run in Lancaster [updated]"
First thing you’ll notice when they’re on to you: the telephone. The time it takes to get a dial tone, absence of background noise, strange presence of others listening in, calls which don’t readily disconnect; sometime between that night and now, the guy driving that truck’s noticed a subtitle change in the way his telephones function. Authorities already know exactly who this guy is. And, they’re taking their sweet time about it, meticulously choreographing a super dooper deluxe public shaming party, for media consumption. Authorities are going to perp-walk that guy, all the way to a life sentence. … they already know who it is. The Fusion Center people knew, the following morning. All those license plate scanners strategically placed in and around downtown Lancaster, authorities already knew where that vehicle was addressed. But, unless it’s a national emergency, that information isn’t immediately nor automatically handed down from our local Fusion Center, to direct operating level. Local incidents like this never get handed down, immediately. The more local it is, the bigger the lag. Certain buttons have to be pushed before this information finds its way to the L.A. County Sheriff. They know who he is. In good time, he will inevitably be arrested. But, the government doesn’t want to upset us with too fast a response. It’s one of those things, like all those corny old movies, with the fictitious 2 minute interval, for a call trace? In actuality, that call trace was always immediate, General Telephone and the federal government never wanted to upset you over the revelation just how much power they really hold, over you. Those license plate scanners, it’s immediate. The guy could have otherwise been arrested that evening. Fusion Center ops typically sit on their hands on local incidents, waiting for a local to step forward. Still nothing after a month or two, an “anonymous tip” will mysteriously trickle down to LASD. Ive driven by the scene of the accident for the past 3 days after leaving a buddies house heading home at night. Each time i do theres been a group of guys and girls standing near the hooka bar or near the parking area across the street that continue to mad dog me and point at me as i drive by. One night, one of the males threw up his hands at me and started waving me to come back. But with a not so friendly look on his face. So i just kept going. Again, about an hour ago a male and about 6 females just stood in the street mad dog’n me and broke their neck as i drove by. Now after seeing this article it makes a little more sense. Its gotta be the white truck i drive. Glad to see they got footage of the truck. Now someone needs to tell these people their looking for a newer Ford not an older Dodge before they end up doing something stupid to the wrong person. And to anyone driving a white truck in that area, i recommend taking a different route until these kids figure out the difference between the two. Im sorry for their loss but you got the wrong guy and the wrong truck. Um, they are looking for a newer Chevrolet or GMC, not a Ford or a Dodge….. I cant tell from the pictire given although isnt there a license plate on the front of the vehicle? Probably is but there’s no way to read it from that camera.